In late August, messaging giant LINE launched its own proprietary blockchain, the LINK chain, and its own cryptocurrency, the LINK token. While LINE is the first publicly traded company to have launched its own blockchain mainnet, it isn’t the first social media network to embrace cryptocurrencies. In this regard, it is joining the ranks of Kik, Kakao, Telegram, and (possibly) Facebook. All these companies have shown interest in adding cryptocurrency support on their networks, and some of them have already taken major steps. This all begs the question: At a time where cryptocurrencies are facing a major slump and there’s a lot of negative sentiment about ICO scams, why would established companies endorse cryptocurrencies? As it happens, cryptocurrencies and social media networks have characteristics and strengths that can complement each other’s weaknesses. To be fair, not everyone is doing it correctly, but the general idea of having cryptocurrencies on social media is a promising one. Note: This post is not about decentralizing social media. We have previously discussed the broader concept of running social media networks on blockchain, if you’re interested. Ten years after the invention of bitcoin, we have more than 1,000 cryptocurrencies, but none of them have become a mainstream method of payment. Cryptocurrencies are still a nascent market, and they’re facing several challenges. Some experts believe they will never become currencies and will instead develop into speculation and investment vehicles. A large part of those challenges are technical (e.g. the speed and volume of transactions), financial (e.g. fluctuating prices and high transaction fees) and legal (e.g. lack of clear regulations). But one of the biggest hurdles that bitcoin and other digital currencies face is that not enough people are using them and not enough merchants, retailers and services support them. True, bitcoin has tens of millions of users, probably more than many national currencies. But let’s not forget that bitcoin was supposed to be a global payment system that enables users to process payments beyond geographical borders without going through centralized financial institutions. With such a small user base, cryptocurrencies are faced with a serious problem. True, you can transfer bitcoin from say the U.S. to Nigeria without going through intermediaries. But the recipient of the bitcoin can do very little with the received funds because few people support it. They’ll have to find some exchange to convert it to fiat before being able to spend it. The conversion process is clunky, costly, and is subject to local regulations, which all add to the friction and the difficulty of the experience. There have been several attempts at adopting cryptocurrencies in different industries and bringing liquidity to the market by creating decentralized exchanges where users can trade different tokens and cryptocurrencies. But they haven’t been able to move the market much beyond the world of cryptocurrency enthusiasts. The many scams and questionable practices attributed to cryptocurrencies have also caused a general sense of mistrust toward cryptocurrencies and the companies that issue them. This also slows down the rate of adoption. The bottom line is, as long as a very large number of people don’t start using them, cryptocurrencies have very little chance of emerging from their niche and will remain at the mercy of governments, financial institutions and their own ethical and technical challenges. Large social media networks fulfill the most important requirement of cryptocurrencies: a large user base. Facebook, Facebook Messenger and WhatsApp each have over 1 billion monthly active users (MAU). Telegram and Line each have over 200 million monthly active users. LinkedIn, the largest professional network, has over 200 million montly active users. In many regions, social media and messaging apps have become one of the main mediums for daily business operations and growth. Adding support for cryptocurrency payments in messenger and social media apps will solve the user problem. 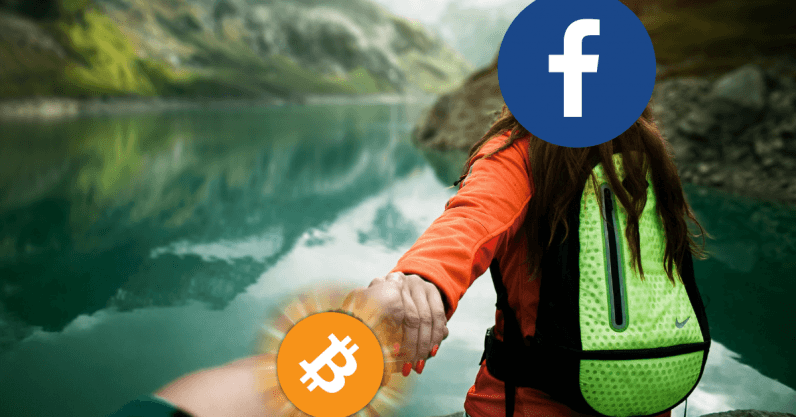 In a hypothetical scenario, even if 10 percent of Facebook’s MAUs decide to use FaceCoin, it will become the most popular cryptocurrency in the world. Moreover, social media and messenger applications are already providing users with the networking and communications infrastructure, which means users don’t need to use several different apps to accomplish a use case that involves payments, and developers can create countless applications on top of the social media’s platform and its cryptocurrency to create new business models. With so many users using the cryptocurrency, the need to interface with the fiat world reduces. Users who earn FaceCoin can spend it to receive services and goods from other users on the platform without converting their coins to fiat. Take note that this does not require to decentralize the entire application. The social media and messaging platforms can remain in their current centralized form. It is only the payments that will be running on cryptocurrencies and blockchain. Payments are not new in social media networks. For instance, Facebook supports more than 80 payment methods. But when you have a user base that spans the entire globe, it’s hard to cater to needs to everyone. Many regions have access to Facebook, but don’t have access to banks or the payment services supported. And making payments between different currencies can incur extra fees. That’s partly why payments on social media platforms have very limited functionality and adoption. Facebook could’ve created its own in-app currency, like the ones you find in games such as World of Warcraft. But the problem with in-app currencies is that they’re tied to the company that runs the app and its servers. They can’t be traded outside the app, even though they have value. That’s way users have resorted to creating their own unconventional markets for in-app currencies, which often become subject to fraud and scams. The benefit of cryptocurrencies is that they are independent of the social media platform in which they’re used, even if the same company has issued them. Since they rely on blockchain technology, their payments don’t need to go through the company’s servers. For instance, users can buy FaceCoin at decentralized exchanges that supports their method of payment, or trade other cryptocurrencies they have (BTC, ETH…) with FaceCoin and directly transfer it to their wallet address. Likewise, they’ll be able to trade their FaceCoins for other social media currencies (LinkCoin?) or convert them to fiat if they want. The fungibility of tokens will make them much more attractive to users and smoothen their adoption. Payment fees and speed is one of the areas where social media networks and cryptocurrencies can truly benefit from each other’s strengths. One of the problems with cryptocurrencies is slow and costly payments. Bitcoin payments take at least 10 minutes to process, with an average of seven transactions per second. Other currencies such as Litecoin and Bitcoin Cash have addressed the problem by reducing the interval or increasing the block size (increasing the number of transactions it can process per 10-minute interval). While this increases the throughput, it is still a far cry from the volumes that a popular cryptocurrency should be able to support. Cryptocurrencies also have fluctuating transaction fees that can increase as payments volumes grow. Sometimes these fees can spike as high has $60-70, making them inefficient for small transactions. This will surely be a hurdle for social media apps, where people will likely want to make small day-to-day payments. One of the most promising technologies to address the speed and fee problems is the Lightning Network. Made on the Bitcoin protocol, the Lightning Network enables users to make several payments without registering all of them on the blockchain, where all the slow processing takes place. Users can create side channels between each other by registering a single transaction on the blockchain and locking in predetermined amount of coins on the channel. They can then make any number of transactions between each other without registering them on the blockchain, as long as their total amounts remain under or equal to the locked-in amount. Finally, they can close a channel and return the final balance to their respective wallets. One of the features of Lightning Network are hops. When two new users want to process payments, they don’t necessarily need to create a new channel if there’s already a user that they both have open channels with. The third user becomes an intermediary, processing the payment with a hop through the two channels, taking a very minimal fee for the service. One of the challenges of the Lightning Network is that it requires many users to have a variety of side channels open to be able to process all payments without too many hops. This is where the opportunity for social media companies lies. They can setup their own Lightning Networks, acting as intermediaries for fast payments between users. This makes sure that the network is well supported and most users will make their payments with a maximum of two hops, going through the provider. The collected fees will also serve as a source of revenue for the social media companies, giving them a chance to reconsider their questionable monetization policies. Some people might be worried that such a model will centralize Lightning Networks in social media companies and allow them to dictate their own rules, such as raising the fees. This isn’t true. If users think the fees of the social media company are too high, they can always setup their own lightning networks while preserving the optimal experience. Social media companies will have a competitive advantage (large server infrastructure that can provide round-the-clock payment channels), but not too high an advantage to prevent users from bypassing them if they want. Another possible scenario is that these cryptocurrencies will pave the way for the adoption of main digital currencies into social networks.